The FAA continues its plans to overhaul the nation’s airspace as part of the NextGen system, which relies on GPS/WAAS instead of the current network of ground-based navaids. Part of the plan includes shutting down about 50 percent of the VORs currently in use to create a minimum operational network (MON). For more information about plans to shut down VORs and reorganize enroute navigation, start at this post here at BruceAir. The FAA hosts the Aeronautical Charting Forum, a semi-annual gathering of experts to discuss improvements and changes to the charts that pilots and others rely on. 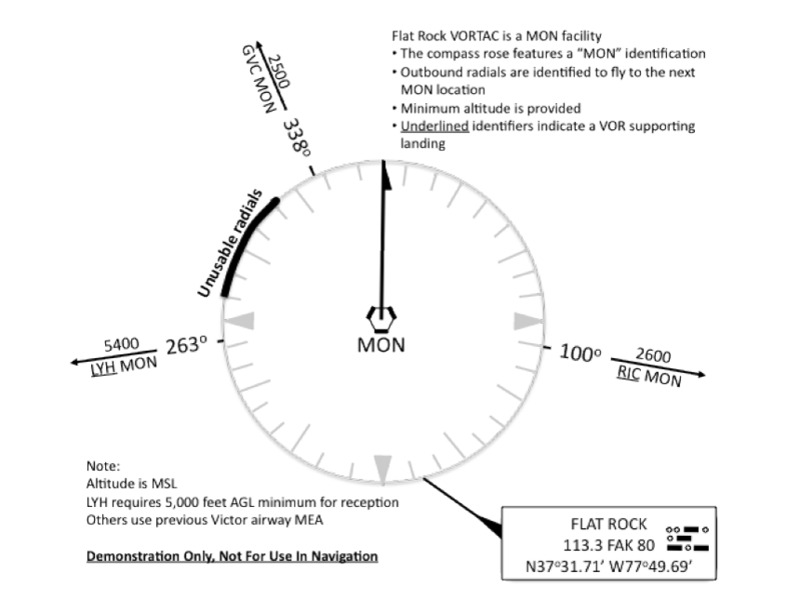 A proposal for the April 2015 meeting includes a document that describes a suggested change in how VORs are depicted on charts, and the text also includes more details about how the national airspace system (NAS) and navigation will change under performance-based navigation (PBN), which is an enhanced version of today’s area navigation (RNAV) concept. The VOR MON program (AJM-324) is discontinuing the service of approximately half of the VOR facilities in the NAS. In parallel, the PBN Policy and Support Group (AJV-14) is planning to implement a new PBN Route Structure, which will provide “Structure where necessary and Point-to-Point where structure is not needed.” The PBNRS will generally remove most Victor Airways and Jet Routes east of the Western Mountainous region of the CONUS. Q-Routes will be published where needed, particularly in high traffic density airspace east of Chicago to New York, Atlanta, etc. T-Routes will provide structure primarily around Metroplex areas, special use airspace, and for terrain avoidance in mountainous terrain areas. The rest of the NAS will likely fly point-to-point using RNAV. The document then describes how VORs that are part of the MON but which are not points along named airways might appear on aeronautical charts. As this new strategy is implemented, many of the VORs retained for the MON will not have any VOR Airways associated with them, but pilots will need to use them to navigate VOR-to-VOR. Therefore a charting scheme is needed. The VOR MON Concept of Operations includes a proposed scheme for charting the MON VORs which is depicted in the figure below. The approach is to use feeder routes showing the MEA, course, and distance to each adjacent MON VOR. I plan to comment on the use of MON, used to distinguish VORs that are part of the MON and not associated with airways from other navaids. I think the use of a three-letter abbreviation will cause confusion when printed near a VOR symbol that is also associated with a three-letter identifier. If you have comments, direct them to the ACF.